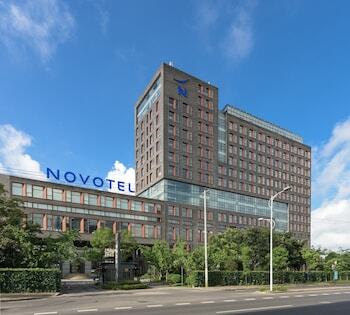 With a stay at Novotel Shanghai Clover in Shanghai, you'll be 5.7 mi (9.2 km) from Shanghai Disneyland© and 9.3 mi (15 km) from Century Park. Featured amenities include a computer station, a 24-hour front desk, and luggage storage. A roundtrip airport shuttle is complimentary at scheduled times. With a stay at Kunming Royal Garden Hotel in Kunming (Guandu), you'll be convenient to Guandu Museum and Gateway to Heaven. Free self parking is available onsite. Located in Xi'an (Xi’an City Center), Mark and Henry Apartment is within a 10-minute drive of Drum Tower and Xi'an Bell Tower. Self parking (subject to charges) is available onsite. With a stay at Gems Cube International Hotel Shenzhen in Shenzhen, you'll be 9.1 mi (14.7 km) from Happy Valley and 9.1 mi (14.7 km) from Window of the World. Free self parking is available onsite. With a stay at Beijing Guangxi Hotel in Beijing (Panjiayuan), you'll be within a 15-minute drive of Hongqiao Market and Wangfujing Street. Self parking (subject to charges) is available onsite.